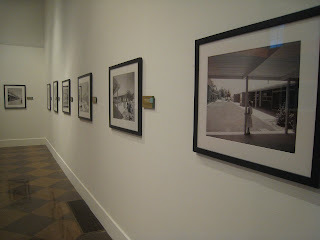 My husband and I attended the opening night reception of Fullerton Museum’s new Forever Fullerton exhibit featuring the classic photography of world-renowned mid-century architectural photographer Julius Shulman. This was an especially exciting treat since I've admired his iconic images for years. But what made it even more special was the exhibit was comprised entirely of photos he took here in Fullerton during the 50s and 60s. 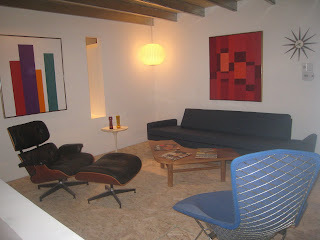 More specifically of the Forever House tract of mid-century modern homes designed by Eichler design team Jones and Emmons. There were also images of Nicolas Junior High, Golden Hills Elementary and Fern Drive Elementary, which was cool for us since two of our children currently attend this school. 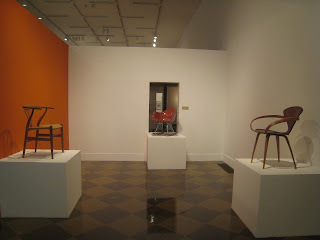 The exhibit also featured authentic retro furniture staged in a living room setting. The equally fitting exhibit structure itself was designed by Fullerton’s own Silber Architects, whom were also instrumental in getting the show off the ground. The following reception included a nice buffet dinner and live jazz entertainment. Kudos to Fullerton Museum curator Richard Smith, and everyone else who made the exhibit possible. Whether a fan of mid-century architectural photography or just interested in seeing what homes looked like during the atomic age, do yourself a favor and visit before it closes July 19. You won’t be disappointed. this was a great event. thanks for posting info pics.